In the mid-1990s, the eastern monarch population was more than one billion. In winter 2013, the population had dropped by more than 95 per cent to 35 million, with a modest increase to 56.5 million this past winter. Much of the monarch butterfly decline has been pinned on the virtual eradication of its critical food source milkweed. The monarch butterfly is a wonderful creature with an amazing story. In late summer, monarchs in southern Canada and the U.S. northeast take flight, travelling over 5,000 kilometres to alpine forests in central Mexico. The overwintering butterflies cling to fir trees there in masses so dense that branches bow under their weight. The monarch's multigenerational journey northward is every bit as remarkable as the epic southern migration. Three or four successive generations fly to breeding grounds, lay eggs and perish. The resulting caterpillars transform into butterflies and then take on the next leg of the trip. Monarchs arriving in Canada in late summer are often fourth or fifth generation descendants of butterflies that flew south the previous year. What may be the monarch's most striking quirk is its caterpillars' reliance on milkweed as its sole food source, a phenomenon called "monophagy." Milkweed plants contain small traces of cardenolides, bitter chemicals monarchs store in their bodies to discourage predators, which associate the butterflies' distinctive colouration with bad taste. But relying on a single type of plant for survival is a risky strategy that has put monarchs in grave danger. In the mid-1990s, the eastern monarch population was more than one billion. In winter 2013, the population had dropped by more than 95 per cent to 35 million, with a modest increase to 56.5 million this past winter. As University of Guelph postdoctoral research fellow Tyler Flockhart notes, a single severe storm could extinguish the entire monarch population. A 2002 snowstorm wiped out 80 million butterflies. A similar trend has been occurring west of the Rockies, where the western population overwinters in California and migrates as far north as central B.C. Much of the monarch butterfly decline has been pinned on virtual eradication of its critical food source throughout much of its migration path by profligate use of a glyphosate-based weed killer called Roundup, which corn and soybean crops have been genetically modified to tolerate. Blanketing fields with the herbicide kills plants like milkweed. 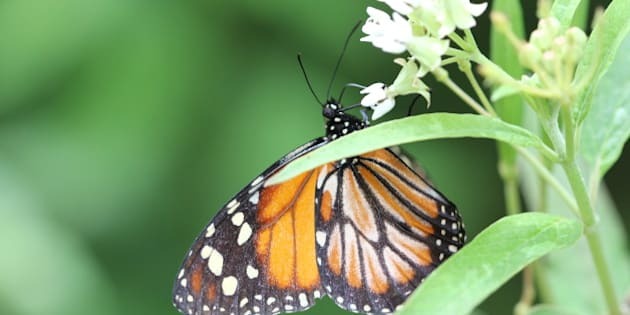 As a result, several U.S. Midwest states -- the heart of monarch breeding territory -- have lost most of their native milkweed, causing monarch reproductive rates to drop by more than 80 per cent. A recent study suggests glyphosate is merely the first of a one-two toxic punch from industrial agricultural operations. The second is neonicotinoids, the controversial nicotine-based insecticides that have been identified as a chief culprit in the decline of honeybees, along with a host of birds, bees and butterflies. It appears that even at one part per billion, these chemicals can affect monarch caterpillar development, delivering a potential knockout blow for the imperilled insects. The good news is that many jurisdictions are catching up with the science. Ontario's government has proposed regulations to reduce neonic use by 80 per cent over the next couple of years. In early April, the U.S. Environmental Protection Agency issued a moratorium on new applications to use neonicotinoids. I hope this marks the turning of the toxic tide, but time is running out. What can you do to help? While government agencies in Mexico, the U.S. and Canada are scrambling to hatch plans to save monarchs, the scientific community has been clear: A lot of milkweed must be planted over the next few years. One great opportunity is the many thousands of kilometres of linear corridors -- rail, road and hydro rights-of-way -- that run throughout the migratory landscape and can be modified to grow milkweed and other pollinator-friendly plants. Yards, school grounds and parks are also perfect for butterfly gardens and milkweed patches, and planting milkweed in your backyard or balcony garden is a great way to help. Be sure to call your local garden centre or nursery to ensure they stock native milkweed plants this spring. Find out more about milkweed and information about how to bring monarchs back from the brink at davidsuzuki.org/gotmilkweed, the David Suzuki Foundation's Got Milkweed campaign website. You can also donate to support Foundation volunteers planting milkweed in the Greater Toronto Area. Planting milkweed may seem small, but the combined actions of thousands of concerned Canadians stitching together parks and yards with schools and rights-of-way into a glorious tapestry of butterfly corridors could usher in a new, hopeful era for monarch butterflies. Written with contributions from David Suzuki Foundation Communications Specialist Jode Roberts.